Before you roll your eyes, yes that’s a photo of Tiger Woods. And aside from the complete cluster that will be the Monday of his return, he will be feeling the pressure to “perform” at the Masters despite the distractions. But as different as this time around will be, it will actually be more like recent years than you’d think. Every year, The Masters Tournament is Tiger’s to lose. Everyone still agrees he’s the best golfer, and he’s done very well here in the past. So it stands to reason that he will eventually win again. As I mentioned in a previous post, Tiger has not won in my three years covering the Masters. Therefore my photographic perception of him is skewed toward a club tossing, tantrum throwing and ugly face making Tiger Woods. Not the fist pumping, joyous outburst version I’ve heard about from colleagues. Granted, every year he’s been pretty close, and if he were a guy like Shingo Katayama, he’d be happy for a good showing, and recognize that the golf course clearly beat him that day. 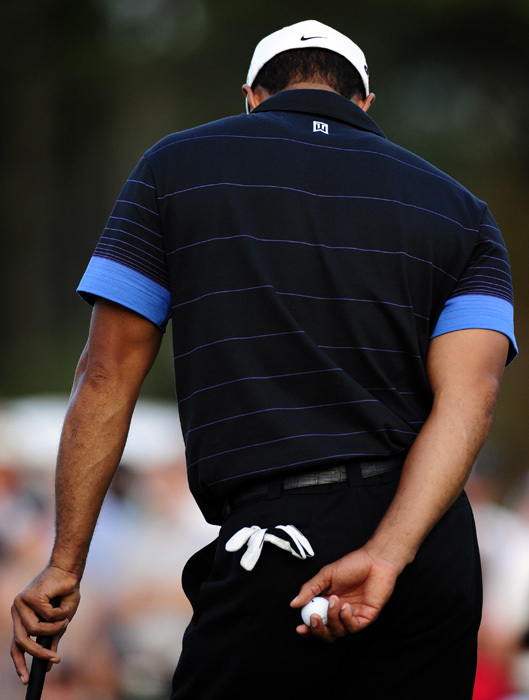 But ending up in the top 5 or 10 to Tiger just means he lost a little slower than those who finished behind him. 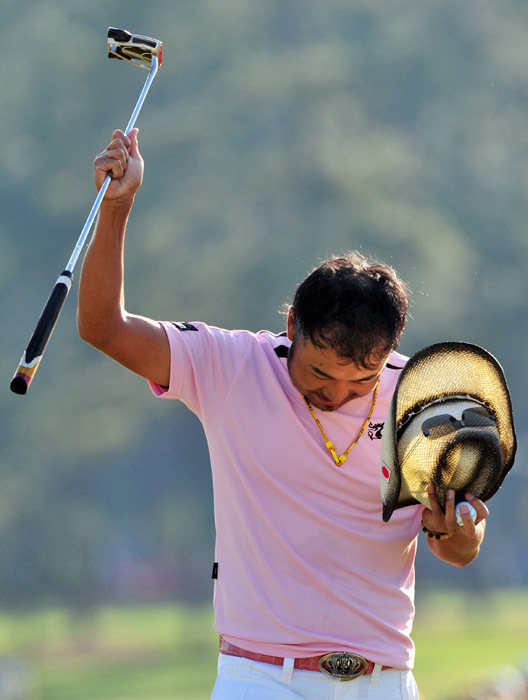 It’s win or lose for him, especially at the Augusta National. Every April is Tiger Watch. People are drawn to him for a multitude of reasons, and we’re there to capture that. But no matter how you look at it, a good photo of Tiger celebrating victory will always trump a good photo of Tiger losing it on Masters Sunday. Because nobody likes a loser. 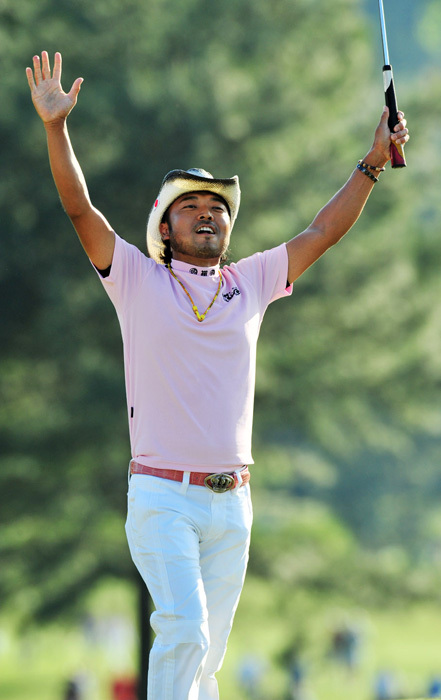 His name is Shingo Katayama, and I hope he wins the Masters one day. The man knows how to give it up when he does well. And in 2009, he did pretty darn well. He finished fourth at 10-under so he had good reason to celebrate. But Shingo celebrates fourth as if he won the thing. The photo staff at the Chronicle jokes that if he ever takes the green jacket, he’ll be making snow angels in the bunker and running around the 18 green high-fiving everyone. And that’s probably not very far from what would really happen. So, for this Tuesday edition of the Masters Preview blog post, here are two photos from Shingo’s walk up to 18 green on Easter Sunday, 2009. What a demonstration of joy. Masters Preview: Some things never change. For the next week, I’ll be updating every day with favorite/interesting shots from previous Masters tournaments I’ve covered since I’ve worked at the Augusta Chronicle. My second Masters, in 2008, was my favorite and best so far. After a “learning” year in 2007 where I tried to get my bearings around the course, the next year was pure fun. The light was on my side all week, photo opportunities seemed to be all over the place, and I got the winning shot of Immelman flexing his muscles after a dominating performance. But probably the most interesting photo happened after the golf was played, and even after the green jacket ceremony. Traditionally (what isn’t tradition at this place? 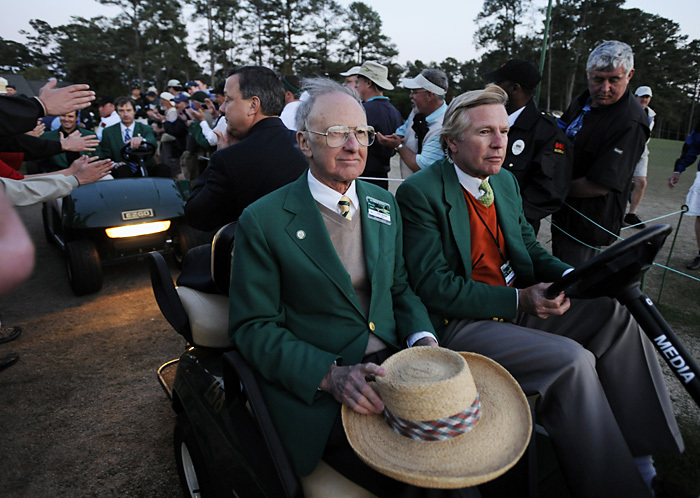 ), after the winner dons the most famous coat in sports, an Augusta National member drives him down to the press center for interviews in a parade of golf carts. Patrons line the ropes for high-fives as he is shuttled only a few hundred yards and it’s a good time for a candid shot of the winner with a thumbs up or slapping hands with someone. As I waited for Immelman to make his appearance, I noticed that the first cart waiting in line had my boss, Billy Morris, owner of the Augusta Chronicle and Morris Communications, and National member, riding shotgun. As a photographer, and employee, I thought it would be a nice thing (and couldn’t hurt my chances at keeping my job) to fire off a few frames as he passed, then go on to doing my business, most notably taking pictures of Immelman. Apparently, Mr. Morris always rides the lead cart, because I took an almost identical photo of him again in 2009. I didn’t think much of this until a few weeks ago, I was helping to find a file photo from an early 90s edition of the Masters (shot on film of course.) Among the dozens of contact sheets that I sifted through, I came across a long gone photographer’s take of the green jacket ceremony. And to my amusement, there were three frames of a younger Billy Morris riding shotgun on a golf cart. Some things never change. March 21,2010. My new son’s birthday. Born at 4:18 p.m. to a stunned dad (who still can’t believe THAT could come out of HER) and a mom who was a champ through the whole thing. Ten hours in labor is nothing for her side of the family. In my mind, and you won’t convince me otherwise, Ayrton Senna was the greatest Formula 1 driver of all time, period. Some say Fangio, others say Schumacher were better. But Senna was the best in an era where the cars were getting faster and faster, but none of the electronic aids had come into the sport yet. It was a time when drivers were still manually shifting (i.e. clutch and stick shift) and no traction control or other handling assistance had been invented. It was the height of car control. He was a master at going faster and faster, always on the edge but rarely tore the car up. And he drove with his soul. In 1994, he lost his life after crashing at the San Marino Grand Prix in Imola. To this day, the cause of the accident has still not been fully determined with theories ranging from a steering column failure to the car simply bottoming out over the bumps on the Tamburello corner. I consider myself very fortunate to have watched Ayrton Senna race and remember fondly rooting for him while my dad supported Alain Prost, Senna’s French teammate at McLaren at the time. You’d think I’d prefer the French guy, but he was too quiet for my tastes. I much preferred Senna’s fiery character and fly by the seat of your pants style. 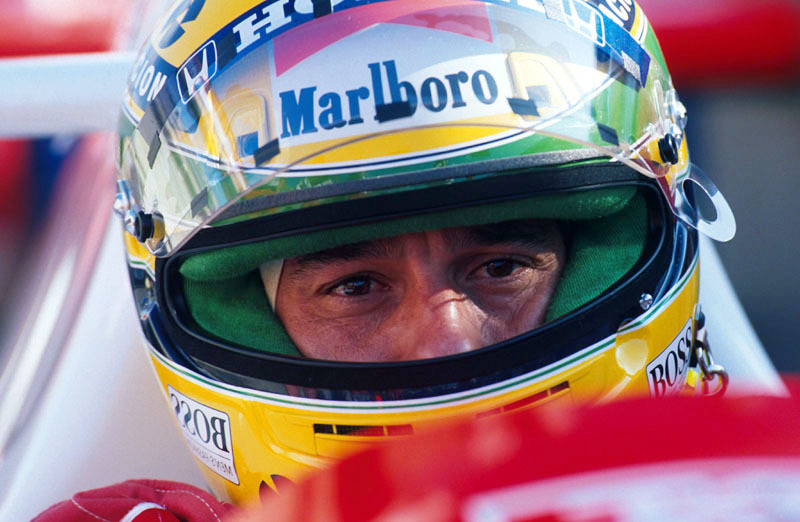 Plus, his famous yellow helmet, accented with green and blue (Brazil’s flag colors, his homeland) was just so cool, and contrasted against the white and red Marlboro McLaren Honda he drove. He solidified my love of auto racing, which eventually led to my interests in photography. The man was a prodigy going up the ranks in F2000, F3. 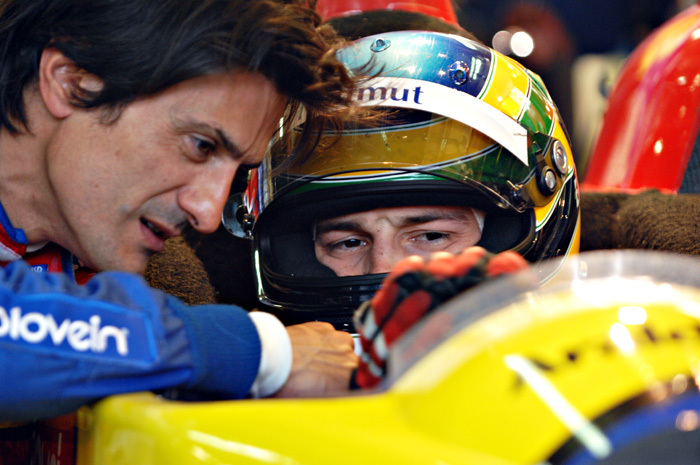 A living legend while in F1. A god in death. And my son has a small connection to the man who helped define my career and to a large extent, my life. In 2009, I covered the Le Mans 24 Hours (a race held in my old backyard in France) where Ayrton’s nephew, Bruno Senna ran with the ORECA team. Yeah yeah yeah, by now we all know he’s coming back to golf, and he’s chosen my backyard to do it. But regardless whether or not you think he deserves all the media hype, or the American people’s short term memory treatment, the greatest golfer of the modern era is going to compete in his 16th Masters in less than a month. Tiger hasn’t won at the Masters since I’ve been a staffer at the Augusta Chronicle, but come every April, sports writers everywhere talk about whether or not this is “the year” for him to win, almost like it’s a matter of when, and not if. And seeing as the British-based bookie William Hill has the odds at 5-1 that Tiger will come back from four months off, deflect every personal question directed toward him and somehow block out the massive crowd following his every move on and off the Augusta National, to win his fifth Masters, I’d say it’s starting again. And as for the media hoopla, time will tell. But I’m already hearing of freelance photographers getting gigs just to cover the media presence around the National (since it’s the next best thing you can do when you’re not credentialed.) Think of it as paparazzi-ing the paparazzi. I’m just fortunate I’ll be inside the sanctity of Magnolia Drive and not on the outside looking in. Tigerpalooza 2010 has officially started. One spring day in 2008, on my way to an assignment, a thunderstorm rolled through town. 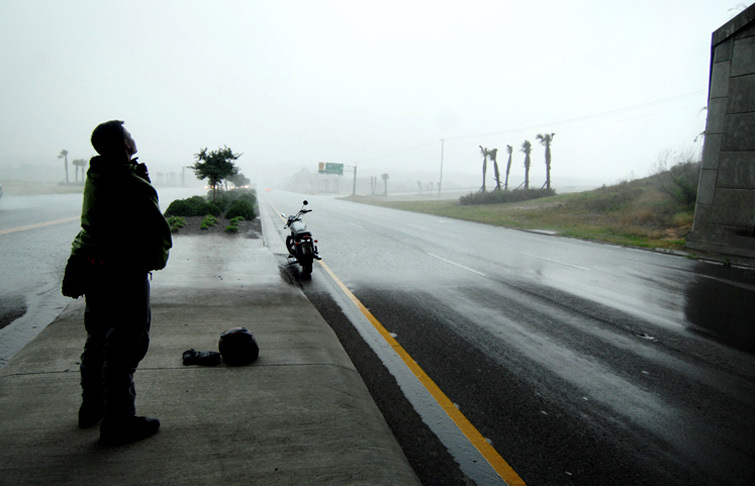 It was gone in only a few minutes, but the downpour was enough for a motorcyclist to stop under an overpass to put on rain gear. As he put on his jacket and examined the sky, he pointed out to me that it looked like an apocalyptic hurricane blowing through. I don’t really know what an apocalyptic hurricane would look like, but I guess this is it. To be honest, I don’t remember if this photo ever ran in The Augusta Chronicle. But either way, it’s got a new home now. Feature hunting is one of those things. The old time killer and newspaper filler. It’s feast or famine usually because you either roll up on something decent or there’s nothing around to shoot. Plus it’s not like an actual assignment where you really have to try hard to make something because you know a writer is putting together a story and it’s your job to illustrate whatever it is. Nevermind if it’s just some lawyer (no offense to lawyers) behind a desk doing paperwork. Figure something out. You’re the visual guy, do it. No, feature hunting is what you make of it. It’s either awesome or there’s nothing there. It’s awesome this time of year, especially on the first nice days of spring when everyone wants to work/play/be outside. Every few hundred yards there’s someone doing something. Today, I came across two decent features within thirty seconds of each other on Walton Way. These days are like shooting fish in a barrel. There’s no looking necessary, they’re all around you. Yes, the photo is upside down. It didn’t run in the paper that way, but I prefer the long shadows looking like they’re the ones marching. Does it not remind you (vaguely maybe?) of some cold war, North Korean-ish communist propaganda painting? You know, the kind that portrays a group of farmers staring hopefully into the distance but holding up guns instead of farming tools? Maybe it’s the non-descript nature of the shadows (no faces, no distinguishable characteristics apart from human-looking shapes) that force your brain to invent something in their place. 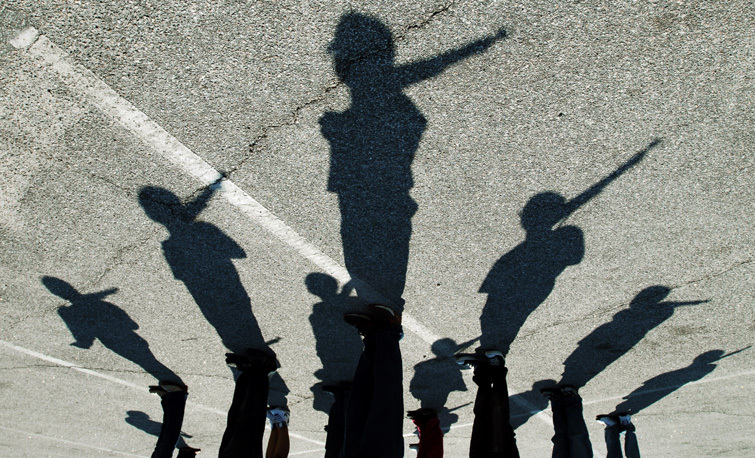 Or maybe they’re just members of a JROTC Drill Team marching in the afternoon sun.